Aldeburgh (pronounced ALL-bur-uh ) is a cute little town on the Suffolk coast with a lot of character and culture. You may have heard of the Aldeburgh Music Festival, but that is actually held in the nearby village of Snape. There is also the Aldeburgh Carnival, which is held every August going back 170 years! Even without a festival, there are lots of things to do in Aldeburgh. In this post, I will give you some ideas on how to spend your time in this English seaside town. Aldeburgh used to be a fairly big port with a shipbuilding industry – a couple of the most significant vessels in English history were built there. Today a lot of the old town has been lost to coastal erosion and Aldeburgh has become a picturesque fishing village and a seaside resort. 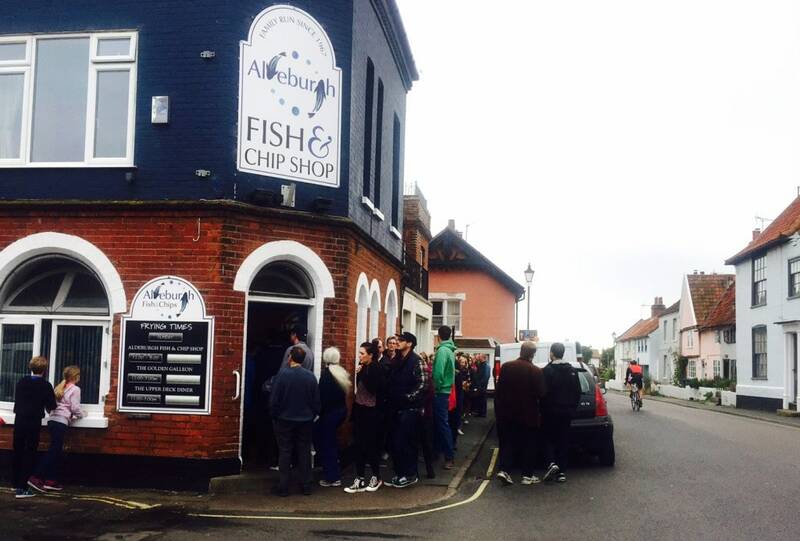 The town attracts many visitors with its famous Aldeburgh Fish and Chips shop. 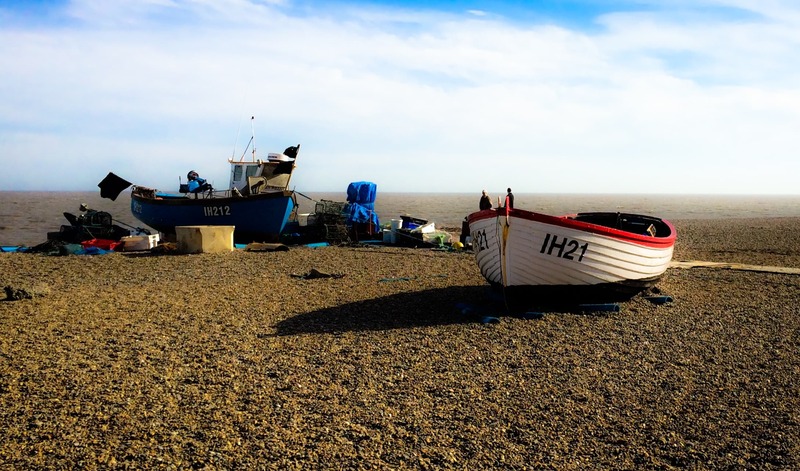 Given Aldeburgh is so small, I was surprised to find so many things to do! I think Aldeburgh has something for everyone. Worst case, especially in the summer, you can just relax on Aldeburgh beach! Fish and Chips is one of the reasons that people visit Aldeburgh. Yes, you can get fish & chips all over Britain, but Aldeburgh Fish & Chips has a reputation for some of the best in the country. Luckily, they have three locations – two takeaway shops at either end of the town (Aldeburgh Fish & Chips and The Golden Galleon) and a sit down restaurant upstairs (The Upper Deck). They are the most popular Aldeburgh restaurants. The restaurant is too small to accommodate strollers, so it does not cater for children under three. The fish is so fresh, possibly caught that morning from one of the town’s fishermen. You can have cod, plaice, haddock, or scampi (shrimp), but the most traditional is cod. They have medium and large portions. Two people can easily share the large portion. While they also offer some other menu items, that’s not why there are long lines. I even waited 30 minutes once. I would avoid the mushy peas though, it’s just wrong. If the weather is decent, go to one of the takeaway shops and then eat your fish & chips on the seawall looking out over the North Sea. Got to one of the famous Fish & Chips shops before noon to be first in line! If English Fish & Chips is not your cup of tea, there are several other options for places to eat in Aldeburgh. The Lighthouse restaurant is popular and focuses on food with ingredients that are as local as possible. You may also like to try Sea Spice which is an upscale Indian restaurant that combines classic Indian flavors with local produce. 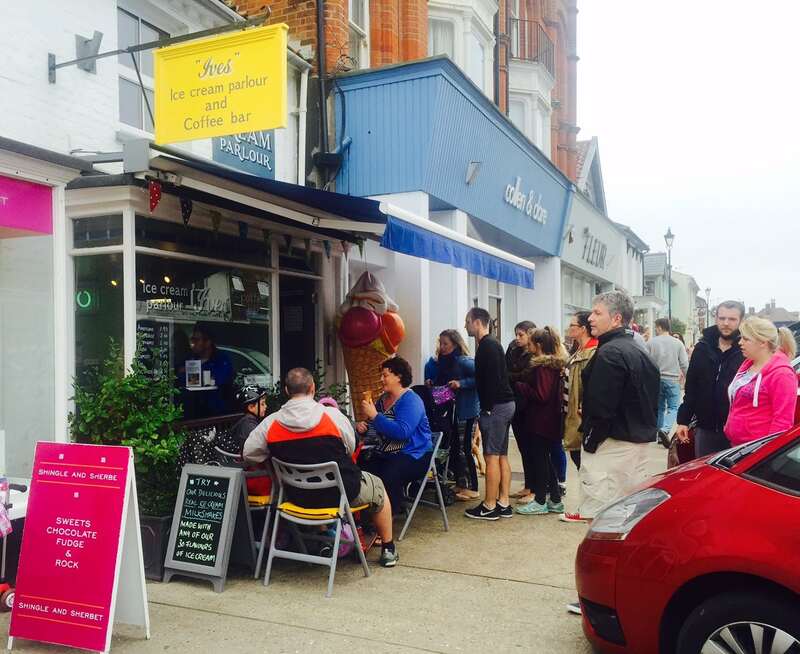 After everyone has their fish & chips, they queue (British way of saying wait in line) for the Ive’s Ice Cream Parlour. On a warm day, you should try some if you still have room in your stomach. They stock over 30 different flavors of ice cream/sorbet/frozen yogurt made from locally sourced ingredients. They even have gluten-free cones! Ive’s Ice Cream is a popular place! Walks on the beach are always relaxing. Since this beach is a pebble one, not sand, it may be more comfortable to walk along the beach instead of on it. Just north of the town on, the beach you will find a rather striking sculpture known as the “Scallop” by Maggi Hambling. It is meant to be a tribute to Benjamin Britten, a composer who spent much of his life in Aldeburgh. The phrase “I hear those voices that will not be drowned” (taken from one of Britten’s works) is written on the 15-foot-high sculpture. 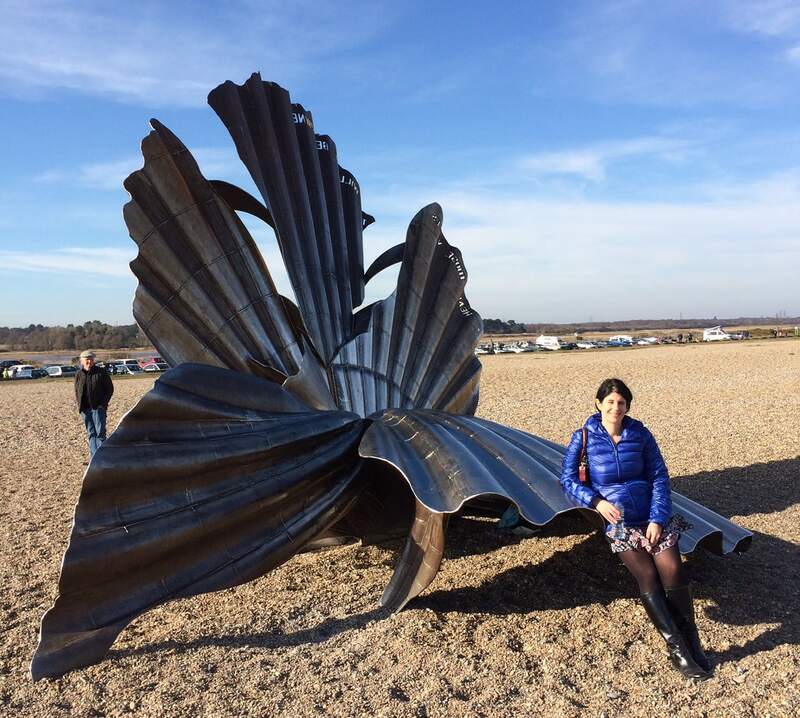 I like the Aldeburgh Scallop but it is controversial because some people feel that it should not be located on the serene beach. You are encouraged to sit on the statue and many children love to climb it. 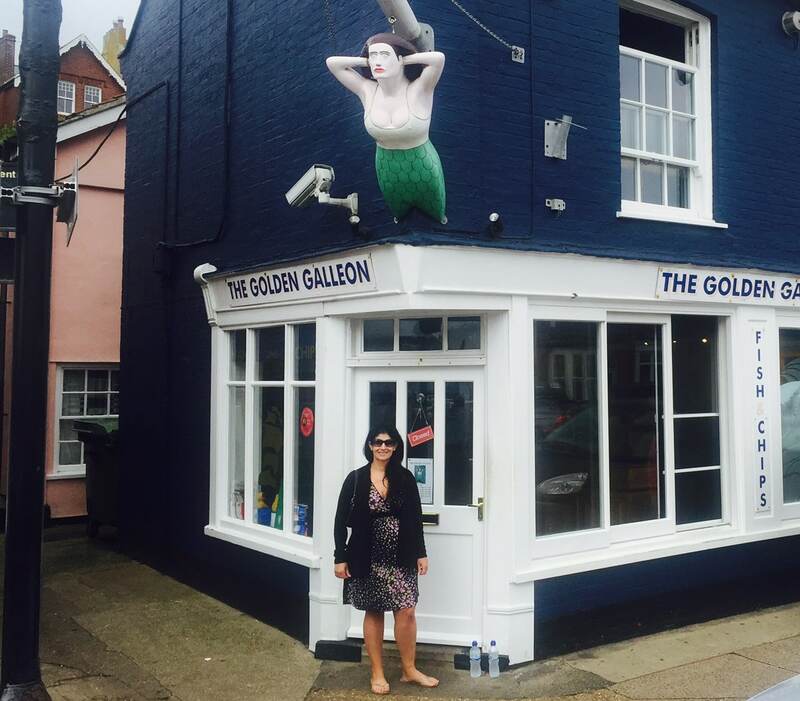 The “Scallop” is not the only artwork in Aldeburgh. There are several art galleries throughout the town. I recommend stopping in as many as you can. We made it to three. The largest gallery is Thompson’s, which also has a location in London. There are several cute shops to check out along Aldeburgh High Street. Adnams, a local brewery, has a store which sells wine, liquor, kitchen accessories, in addition to their beer. Additionally, Alde River limited has a lot of great gifts. Afternoon tea is a great English Tradition. 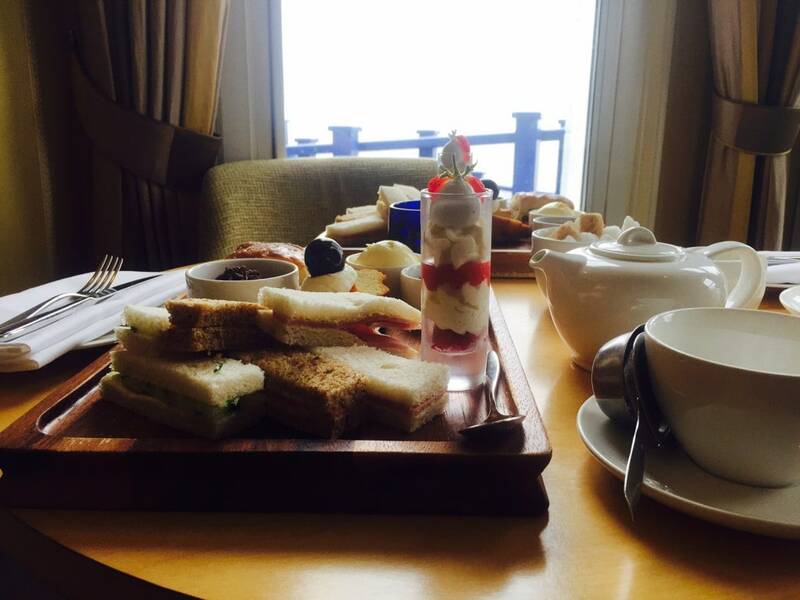 We had afternoon tea at the Brudenell, right on the water at the south end of the town. Afternoon tea here is pretty much a meal – sandwiches, scones, and other treats- and you get your own pot of your choice of tea. My favorite part of tea is the clotted cream (this is not the same as butter!) that you put on your scone. I would describe it as a sweeter creamier butter. Unfortunately, it is not really available outside of the UK. 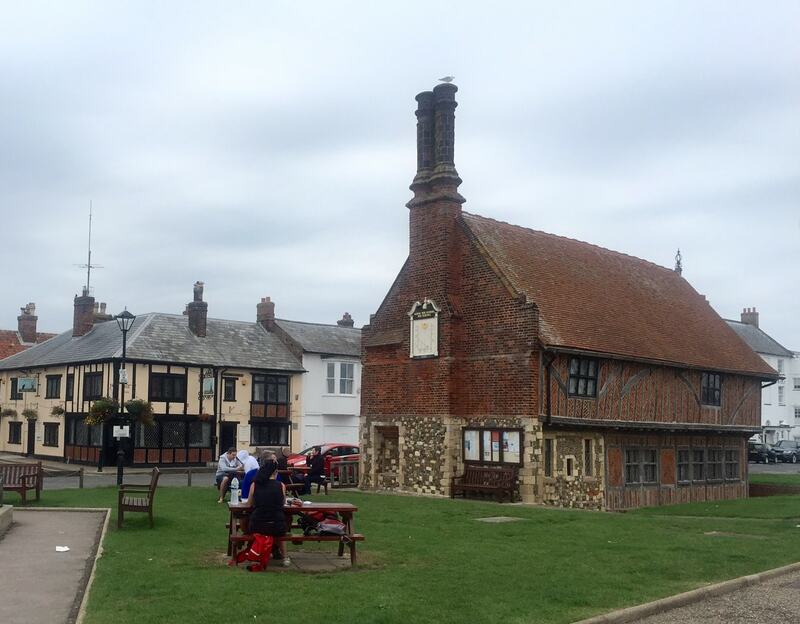 As in pretty much all English towns, you have several pubs in Aldeburgh to choose from. The Mill Inn, located close to Moot Hall (the town hall that has been used for council meetings for over 400 years), is a good option. The Ye Olde Cross Keys Aldeburgh is a pretty pub that dates back to the 16th century. If you are a golfer, the Aldeburgh Golf Club, established back in 1884, is worth a visit. They have two courses that you could play. For those looking for a challenge, you can try the Championship Course, which is ranked as the 31st best course in England. This 18-hole Aldeburgh golf course stretches 6,603 yards and does not have any par 5s for the men. The English Ladies have held their championship on this course several times. The River Course is only 9 holes and aimed at beginners and golfers with higher handicaps. Both courses offer lovely views. Aldeburgh is located in the county of Suffolk about 110 miles northeast of London. Unfortunately, Aldeburgh does not have easy access to public transportation. From London to Aldeburgh, you would need to take a train from Liverpool Street Station to Ipswich (about an hour). From Ipswich, you can catch a bus (another 1 1/2 hours) or take the train to Saxmundham and then a taxi. Additionally, if you drive to Aldeburgh, parking can be a problem during the summer tourist season. You might have to drive around a bit to find a space or park north of town and walk to the Aldeburgh attractions. If you get the chance, Aldeburgh is definitely one of the nicest places to visit on the Suffolk Coast. Have you been? I would love to hear about your experience. Go to the Aldeburgh Fish & Chips location with the shortest line, they are all owned by the same family. If it is nice weather, get your fish and chips from one of the takeaway shops and eat on the seawall looking over Aldeburgh Beach. The nearest train station to Aldeburgh is Saxmundham. You will need to take a taxi from Saxmundham to Aldeburgh. It is probably easier to drive, although parking can be a problem in the summer. If you are looking for another nice village to visit on the Suffolk Coast, check out my guide to Walberswick. There’s nothing better than quality fish & chips followed by a couple of pints at the pub! Lovely post – we have yet to make it to Aldeburgh, but are hoping to explore more of England this year, and I’ll definitely be adding it to my list! Thank Kelly. Aldeburgh is such a great town. Try to make it there in the summer if you can. Tanja – Thank you! You must go back for the fish & chips!